Prince George, B.C.- RCMP in Prince George say the truck used in yesterday’s early morning smash and grab at the Pine Centre mall had been stolen from an industrial site in the BCR. 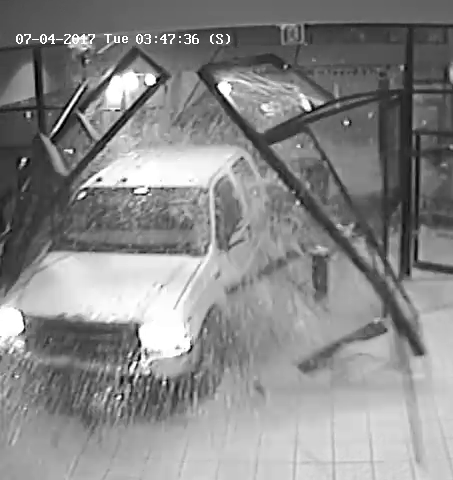 The truck had been stolen about 24 hours before it was used to ram its way into the Pine Centre Mall and then into a jewellery store. The suspect was in the jewellery store when a mall security guard arrived on scene. The suspect then fire a shot from a gun towards the guard, and took off on foot. The security guard was not harmed. So far, all efforts to identify and locate the suspect have been negative. Surveillance images have been obtained from the site where the truck had been stolen and show the suspect and at least one accomplice driving another vehicle before the suspect is dropped off just prior to the theft. The stolen vehicle is then followed from the site. The investigation is continuing. Further information may be released as the investigation progresses. Good luck, sounds and looks like everyone else out there. I’m sure the RCMP will get their man.